I’m about to have CEREC veneers done by a dentist I’ve used very little. He has told me that he does 1.5mm veneers, and that, after research, seems very thick. I’m not sure of his abilities, and CEREC takes a magician to do correctly and natural. Who’s the dentist? That makes all the difference in the world! Only about 1-2% of dentists are artistic enough to create a beautiful smile makeover. So who’s the dentist? That’s the key question – not what material he’s using or how thick. It’s tough to find out any information about Dr. Doe—no website, no Yelp reviews. His Facebook page tells me nothing useful, no Angie’s List reviews. I also checked databases that I have of institutions that train dentists in smile makeovers, and cannot find him listed anywhere. Bottom line—highly risky. Especially given that he wants to make these veneers with a CEREC. There are some dentists who can do that, but this is harder than using a ceramist and requires an exceptional amount of skill. So not finding him among the alumni of these training institutions is troubling. He may be doing that to save money—he doesn’t want to pay a ceramist. And you have to realize that if you get a smile makeover and end up hating how it looks, you have no legal recourse. As long as the veneers meet the standard of care—they stay on the teeth and function all right—the legal standard of care does not require you to like how they look. Use one of our recommended cosmetic dentists. We have a couple in the Denver area, and either one could give you a beautiful smile makeover. I have a bad feeling about Dr. Doe. Dr. Hall, thank you very much for doing the informative research. Even though not much was found, it was enough for me to reconsider my decision, and will give one of your recommended dentists a call, and mention your name. I appreciate your time, of course your effort, thanks for everything. Dr Hall, are you still practicing? Dr Hall, are you still practicing cosmetic dentistry? I have seen a lot of sites and a lot of before and after pictures, but yours are the absolute best I have ever encountered! I want you to do my veneers! Thank you for your kind comments. I am very flattered! No, I am not still practicing. I moved to Arizona about nine years ago and opened this company, Infinity Dental Web, that does Internet marketing for dentists, and that is all I do now, professionally. But while my photos may look impressive to you, I assure you that there are dentists on our recommended list that exceed what I did when I was practicing. I will email you privately with a recommendation of one of these cosmetic dentists near you who is better than I was. I recently had a full mouth reconstruction done by a very reputable prosthodontist, and although it was primarily for functional purposes, aesthetics were of great importance as well. How many people have the opportunity to have all brand new white teeth that match? It was exciting: however it was also a long and painful road. I brought in old pictures of myself to show him the color I wanted and the way my original work looked 30 years ago, and I said “this is what I want”—pretty straightforward I thought. Throughout the treatment, he kept telling me to he wanted me to be happy but sometimes when I would tell him what I wanted he would tell me I was wrong but he always said trust me—I’ve been doing this a long time. When the first set came in, they were not anywhere close to the right color so he told me I picked the wrong color. We did three try-ins. The 3rd time I told his assistant that the top teeth looked dark, that they were darker than the bottom ones and I said that several times. Now mind you, I was trying in an unfinished set of teeth because they had their own lab to do the finishing and I had never seen unfinished crowns and bridges so I had no idea what they looked like before they were finished. Anyway, his assistant assured me that once their lab finished, they would be fine that the top and bottom teeth would match and to trust her. The bottom teeth were veneers, crowns and implants. Now, to clarify part of the cause or my problem; every time we did a try-in, I couldn’t look at the teeth with my mouth open or see how they looked when I talked or with different expressions because the teeth would fall out which made it difficult to truly see the color or to see if the bottom and top teeth matched. So the day came to have everything put in permanently and there were 3 things I wanted to check, one being color! It turned out that one of the teeth was a little sharp. I said that and he said, “Hope, we’ve done just about all we can for you and I don’t think we’ll ever be able to make you happy; so maybe you need to find someone else to finish the job.” I was standing there unable to speak because all of my teeth would fall out, and all I wanted to do was leave—take all the teeth out and leave—but I couldn’t do that. I had no teeth and no money. I just kept thinking don’t do it just leave but how could I? I had no teeth. If I took these out, I would simply have no teeth. What was I supposed to do? From that point, everything is a blur. I remember wanting to leave, telling the assistant that I was afraid to say anything else to him, and tears rolling down the side of my face when he started putting the bottom teeth in. Then I remember asking if they would put the top teeth in with temporary cement and she said no, that he wouldn’t do that. Now, after all of this time, effort, and about $50,000, I have teeth that don’t match. The top teeth are darker than the bottom ones and I don’t know what to do. If it was the other way around, and the bottom ones were darker, then I could probably live with it, but it’s not. This is completely unacceptable—I have to have it fixed somehow. I personally think that he should re-do all of the porcelain over gold crowns and bridges so they match the veneers. Those are at least closer to the color I wanted. I feel so stupid for letting this happen, but I was in shock—like a deer caught in headlights but worse! How do I go about addressing this with him? I’m very picky and the difference in color is DEFINITELY something I would have noticed, but not under those circumstances. I just froze, and I truly don’t feel it was my fault—I was under enormous duress at that moment. As you can see, I’m very emotional and wordy which is not the way to approach this. Do you think this is something he should fix, given the situation; if so, please help me. I do not know how to communicate with him, let alone get the result I believe is fair. So you have a very reputable prosthodontist. He is undoubtedly very good at what he does, from a technical point of view. But you have to realize that your appearance concerns are frowned on by institutional dentistry. This is a classic example of the prosthodontist mentality. You’re trying to tell him what you want. His response is: “Trust me—I’ve been doing this a long time.” In other words, he knows best, he doesn’t need your input on the appearance, and you’re a troublemaker for not just accepting that. I have had several requests from prosthodontists to be listed on this website as recommended cosmetic dentists, and I have turned them all down except one. These are dentists thoroughly steeped in the dental school mentality that focuses on functional issues and trivializes concerns over appearance. This prosthodontist thinks it’s pandering to listen to your appearance concerns. You’re talking to a brick wall here. You’re saying, “I don’t know how to communicate with him.” That’s not the problem. He doesn’t want your input—case closed. Hope—brace yourself here for some tough medicine. You’re going to have to stiffen your spine and go after this dentist. The good news is that you have excellent legal leverage here. You need to have the will to stand up to him. I don’t believe you need to sue this dentist, but my gut tells me, as arrogant as he appears to be, that you are going to need to go to a lawyer and at least threaten to sue. You can try telling him that’s what you’re going to do and see if he will make this right for you financially, but I wouldn’t hold my breath waiting for a favorable response. What you want is for him to pay to have an expert cosmetic dentist fix the upper teeth so they look acceptable to you. You are correct that, if there is a discrepancy in color between the upper and lower teeth, the lowers should be the darker ones. A good cosmetic dentist can get away with pushing the shade of the upper teeth maybe half a shade to a full shade whiter on the Vita scale and it will still look good. But not the other way around. What he did to you was malpractice. No, there is no suggestion here that there is any lack in the quality of the work. But he forced these teeth on you without your consent. Informed consent is a cornerstone of ethical dental treatment. You did not want these crowns on your upper front teeth put in, but he did it anyway. I can see, by the procedures you have explained to me for his trying in these crowns, that he doesn’t care about your input. You said that the work kept falling out if you tried to look at it. Now there are try-in pastes made specifically for the purpose of holding the work in well enough that you can see how it looks. He certainly knows of these materials, but he isn’t interested in them because to him, he is trying the work in only to check the fit and to make sure he likes it. His practice isn’t geared toward taking into account anything about what you think. I’m sure he doesn’t think he did anything unethical, and it’s not going to be easy opening his eyes to that, but a letter from a lawyer, educating him on this principle of informed consent, will certainly trigger a call to his malpractice insurance carrier. They should let him know that he is on very shaky ground, and they should be able to prevail on him to make this right for you. Again, what you want to ask for is for him to pay an excellent cosmetic dentist to take out the crowns on your upper front teeth and replace them. Here’s how you do that. First, find a lawyer who understands well this principle of informed consent. Have the lawyer write the letter explaining what he did wrong (basically, he is guilty of assault). Then, before you settle on an amount, I can recommend for you an excellent cosmetic dentist who can give your dentist a figure of how many crowns would be involved in fixing this and how much it would cost. He may argue that he had your consent. And I’m sure that he had you sign some kind of form before starting treatment. But you did not consent to putting in these particular crowns. Yes, you let him do it, but you were under duress at the time, and consent under duress is not consent—this is a key legal doctrine. You were intimidated, not given reasonable options, and your reaction as you have described it to me indicates that this was not a voluntary consent. Your lawyer I’m sure will be able to explain the advantages of his just settling this matter rather than going to court and having to pay emotional and possibly punitive damages on top of the cost of just replacing the work. Hope, I’m sorry I don’t have an easier path for you, but I have received hundreds of complaints similar to yours and I’ve coached many of those people through situations like this, and you are simply not going to be able to transform this dentist into a listening, caring cosmetic dentist by anything you say. In his own eyes and the eyes of many of his peers he is very good at what he does, and you’re just a peon. He has been taught that it would be wrong to listen to you. I was wondering if you could tell me what is the best way to find the right dentist. I find it to be hard because every dentist requires taking x-rays and by the time you find the right one a person could end up with lots of x-rays done. Is there way around this? I have a couple of suggestions for you, to check out a new dentist without getting more x-rays. There is a lot of information available online about dental practices, especially online reviews. If you go to Google Maps and search for the dentist, you can find his or her Google reviews. Yelp is another good reviews source. Facebook is a third. The second—ask for a complimentary visit. Most dental offices will let you have a complimentary visit if you ask for one. Just tell them you are trying to decide whether to pick this person as your new dentist and you want to come in, get an office tour, and meet people. Many offices will even let you sit down with the dentist for a few minutes and ask questions. But if not, they will at least let you come in and talk to some people on the staff and shake hands with the dentist. A few offices may not want to accommodate you in that way, but you probably wouldn’t want to pick them anyway. Visiting the office will give you a good feel for what the practice is like and whether or not you feel comfortable there. Of course, if I’m wanting to find a cosmetic dentist near me, that’s what this website is for. I would just click the link, enter my city or zip code, and a list of dentists will display. But you seem to be asking for finding a general family dentist. Should I get my crowns done in Costa Rica? I am debating on going to Costa Rica to get my 12 crowns replaced. I have 6 on the top and 6 on the bottom. In Costa Rica they do everything in a lab and it takes two weeks ( So I have to stay 2 weeks, which isn’t a bad thing except the time I can go it will be raining). I am just curious what my options are here in Arizona since I just moved here. I am looking for natural-looking teeth and would like a dentist that doesn’t make my teeth look like they came from a cookie cutter so to speak. In Costa Rica I can get all of my teeth done for around $6000. Not including the travel and hotels etc. Is there anything comparable to that here in Arizona that you know of? I have a question for you before you go to Costa Rica to have your crowns done. Do you think there is any possibility that anything could go wrong in the process of getting twelve crowns? A tooth could break off. You could lose that tooth. The dentist could over-drill and a tooth could become sensitive. You could end up needing root canals. The crowns you get could look pasty and fake. They could be the wrong color. When you get home, the crowns could fall off. The porcelain in the crowns could start to chip away. The dentist could use a material to which you are allergic. The crowns could throw your bite off and you could end up with TMJ disorder. The crowns could affect your speech. The teeth could become hypersensitive and hurt all the time. These are the first twelve things that came to mind, of problems I have either seen or patients have told me about when they had multiple crowns done. It isn’t an exhaustive list. 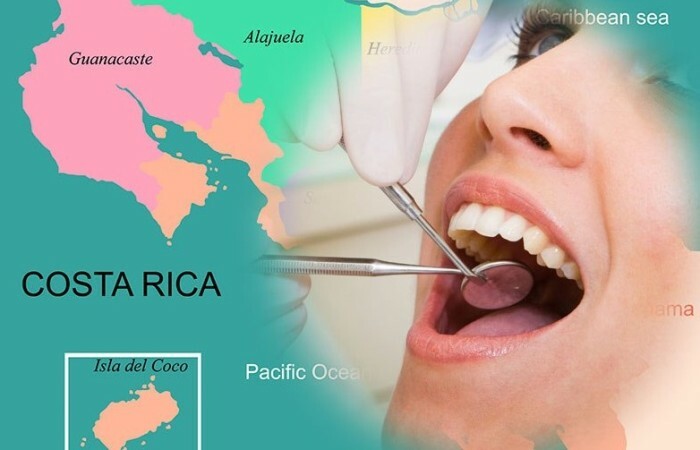 And then here is a link to an earlier blog post I wrote about dentistry in Costa Rica. A woman wrote to me about crown and porcelain veneer work she had done there. She ended up having four of these things on the list go wrong, and some things that aren’t on my list. Another dentist told her that what was done to her by this Costa Rica dentist was criminal negligence. But when she tried to get satisfaction, SHE ended up being the person in legal trouble, because of the corrupt legal system in Costa Rica. She has an estimate of $35,000 to fix the damage this dentist caused. Even with excellent dental care, with that many crowns there is often something that will go wrong during the treatment. It appears that if that happens to you in Costa Rica, you’ll end up stuck. If you want to save some money and you’re in Arizona, one option could be to go to Dr. Isaías Íñiguez. He is actually AACD accredited and has a practice in Los Algodones, Mexico, just across the border from Yuma, Arizona. He charges Mexican fees for what I believe is high quality cosmetic dentistry. Check him out. What recourse do I have against an AACD-accredited dentist who did shoddy and careless work? I drove two and a half hours to see a dentist who advertises on his website as being an AACD accredited and even asserts his AACD accreditation in response to bad internet reviews. (I see that he is not a recommended dentist on your website). I asked the dentist to repair some limited damage done by a previous dentist to a front tooth which should have been a simple job. Instead, this dentist remodeled the entire tooth leaving me with a bizarrely shaped and dysfunctional tooth. Running late, he also did not blend in or smooth down the added composite or polish the rough edges left where he had removed composite. He ran out of the room, saying that I would have to come back since he had run out of time. When I did go back he would only agree to “wax” the tooth and in the course of doing that he chipped the adjacent tooth. I went to the AACD website and was shocked to find that membership in AACD requires only that the dentist pay dues and that the requirements for accreditation (beyond paying dues) are not what most people would consider all that strenuous. I could not determine what this dentist needed to do to gain accreditation because his accreditation took place over 20 years ago. As for what dentists like him need to do to keep their accreditation active the answer is not very much. There is a requirement that the dentist maintain ethical standards (details only available to members) but this is obviously not enforced since this dentist has been sanctioned by the state dentistry board for serious unethical conduct. While you didn’t give the dentist’s name, I’m pretty sure I know who you are talking about. Even though he is accredited I do not recommend him on my website. He and his staff were inexplicably rude to me when I tried to discuss that on the phone with him, so I didn’t list him. I’ve had some association with him over the years. You are correct that membership in the AACD requires only the payment of dues. But accreditation is a different matter. The AACD accreditation standards are fairly stringent and have been for many years, and there has been a large failure rate for those applying to become accredited. This dentist was accredited some years after I was, and I know there was a lot of complaining during that time about the difficulty of the accreditation exams. The failure rate was around 60-70%, as I remember it, maybe more. There was no written exam required at that time, but there was a difficult clinical exam and a scary oral exam. But you are right–once they are accredited they pretty much stay accredited. And the accreditation exam only assesses a dentist’s knowledge and skill, not his ethics. I would make the AACD office aware of this disciplinary action by the state dental board, and beyond that I don’t think there is much you can do about his accreditation. I looked up that issue he had, and my guess is that the AACD people didn’t think it was serious enough to boot out one of their accredited members. But one thing you can do is let the public know about your experience by leaving negative online reviews. I see that this dentist already has a negative one-star Yelp review that validates my impression of him and his office. I think that’s the review you’re referring to, where the response from the office is that he is AACD accredited. You could add yours to that. When more than one person makes a similar complaint, people tend to take it seriously. A little tip on leaving Yelp reviews–if you do just one Yelp review, the reviews tend to be deleted after a week or two. So to establish your legitimacy as a Yelp reviewer, space out a couple more reviews of other businesses that you like. Or become a regular Yelper–Yelp reviews are very helpful. Why is your dental work so ridiculously expensive? A front partial or even dentures are no where near as expensive. $800 or more per tooth is a price that most middle class families can’t afford. At $800 per tooth, four teeth would be $3200. At that price I can have many wonderful procedures done at my local dentist & here you are over-charging for a product that is a false representation of a what the wearer’s teeth condition actually is in the eye of outside observers. I’m appalled at your prices & you guys should be ashamed of charging such ridiculous amounts of money. I was struck by your comment, and while I am putting it in our “hate mail” category, I am not offended by the question or the premise. I think that deep down inside, you know the answer to your own question. In my opinion, there is a place for cheap dentistry. There are ethical practitioners who try to keep their fees as low as they can while still providing care with an acceptable level of quality. This clinic that I have pictured here doesn’t seem to be one of those places, but it might. But it is contrary to human nature to expect dentists who have driven themselves to provide the most beautiful smile makeovers for their patients to do so for cheap fees. Even those with a strong altruistic streak will charge fees that are above average. Some will charge whatever the traffic will bear and so will have fees three to five times the rates of their colleagues doing similar work. Some of the very high fee dentists will create work so meticulously perfect that there is no way they could charge less. That’s the nature of the market, which is a reflection of the variety of human nature. On the whole, however, I think you will find that the cheapest of the dirt cheap dentists will not be as ethical a bunch as those who charge moderate fees. On the issue of how to charge fees, I had an interesting learning experience in my dental practice. I was one of these dentists with a strong charitable streak, and I would feel sorry for patients who would come in with critical needs, who were willing to be treated but couldn’t afford what they needed. When I started, I would have my staff quote the regular fee and then offer a discount. We regularly had trouble with these patients. They became demanding and had a high tendency to complain about their services and even the discounted fee. What I did after I discovered this was that I would tell my staff not to tell the patient that this fee was discounted. We would discount it, sometimes charging only a fraction of the regular fee, but we would present it to the patient as “this is the fee,” as if it were the regular fee, without any mention of a discount. The complaints stopped. I’ll let you psychologists figure out that one. There is clearly a credibility gap in this world when you try to tell people you’re doing something out of the goodness of your heart. So I learned to just do it without making any attempt to trying to communicate to the patient that there was any “goodness of my heart” in the mix of what I was doing. Can you recommend the best cosmetic dentist near Huntsville, Alabama? I’m not happy with the options my dentist is giving me. It’s very simple to find my recommended cosmetic dentist. Just go to my “Find a cosmetic dentist” page, type in “Huntsville, AL,” and click “Submit.” If you want to, you can put in a mileage range for how far you are willing to travel, but you don’t even have to do that. In Huntsville, I recommend Dr. Steve Murphree. I’ve checked out his credentials, interviewed him over the phone, and seen photos of his work, and he is excellent.